Is Quality Control A Waste of Time? If we roll back the clock just a bit, the support services provided by most large corporations lacked any formal quality control. You had people who were dedicated to performing a function, but there wasn’t formal training or process controls. Still, having a dedicated group of people to provide a service was a big step forward. Before that, the service was provided occasionally or not at all. As the demand for the service grew, so too did the complaints. Many different employees were now touching the same product. With so many individuals involved, you need to set and enforce standards, or the number of problems will get completely out of hand. Eventually, the volume of work is great enough for justify investment in a new group to review and correct work before it is returned to the customer. This is how most manager’s start-up a Quality Control (QC) group. But managers often forget that this necessary step, is not the final step. Every time a new management philosophy pops up, it either comes packaged with a new set of buzz words or existing words are redefined. Six Sigma is no exception. The term “waste” is redefined as the difference between potential quality and actual quality. In plain English, it is the difference between perfect work and the work that was actually done. Waste is all of the errors and mistakes that need to be worked on a second time to be fixed. Lets also limit our definition to work performed BEFORE it is reviewed by Quality Control; organizations with multiple levels of QC often measure “baseline quality” from different starting points. Theoretically, this is the best work your production staff can perform. 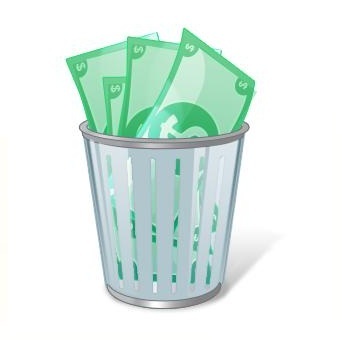 Everything you do to re-work errors, the “waste” that raises the cost of production, could be avoided if you redesigned your production system to eliminate the cause worker errors. Fewer worker errors, means less rework, and lower total cost. Pretty straightforward! Six Sigma (and its cousin Lean… often used together and called Lean Six Sigma), asks the question, “Why do you want to keep paying for a big quality control group? Wouldn’t it be better to investigate why the team makes these errors, and then find a way to make them go away?” It’s a very good question. Identifying and fixing the source of errors is almost always more cost-effective than continuing to fix errors after they occur. The QC group is a necessary step along the way in the evolution of your service. The next step in their evolution is to move from fixing individual products to fixing the production process: identifying and eliminating the sources of errors. Do you need to follow the Six Sigma process to do this? Absolutely not. However, if you’re going to pick a method and follow it, Six Sigma is as good a method as any and better than most. Let’s take a look at what a Lean Six Sigma analysis might tell us about a typical Document Center (Microsoft Word and PowerPoint, with a few other applications, producing templated documents). Cost: When we create a QC department, we often forget about or lose track of, the real cost of this service. You not only pay for QC staff and processes, you make the production staff more expensive and less productive. That’s the part that is often forgotten. Let’s figure out the details. Proofreading and QC in a document center usually takes between 25% and 50% of the original editing time, depending on the QC process. For every hour of time spent editing the document, you spend an additional 15 to 30 minutes on QC. But what happens when QC finds a problem? The document then needs to go back to production, to fix the errors. Let’s give production 10 minutes to read and make (or question) corrections. If you can/should wait for the original operator to make the corrections (there may be questions for the operator), it may take a bit more time. Whoever makes corrections, the document then goes back to QC to go through the document a second time, and: look at the original request, check that the original edits were not disturbed, that the second round of corrections was performed, and that no new accidental or interpretive changes were made. Whew! Make this an optimistic 5 more minutes. If two different QC’s look at the document and have different opinions of what’s right and wrong, it might generate a third round of corrections. The original production work took one hour, and the QC process took a minimum of 30 to 45 minutes. That means that 33% to 43% of the total work is (by Six Sigma definition) waste. It’s probably higher, because the QC and production person probably hand their work back to a supervisor, or workflow coordinator or other administrator. Time: It’s a gross simplification but Six Sigma focuses on cost and Lean focuses on time. How much time are we losing to waste? Not surprisingly it’s a LOT more than 33%-43%. Here’s why… if this is a reasonably well utilized document center, people aren’t sitting around with nothing to do. When the production person is ready to hand over work to the QC person, the QC’er is probably working on something else. Likewise, when the work is handed back to production for corrections, that person is working on the next job. Therefore, work waits between hand-offs until the next person is available. Let’s call this “idle time”. To understand how much idle time exists, let’s assume that all document work averages one hour and all QC work averages 30 minutes, and that we have the two-step correction process we discussed in #1, above. With QC work averaging 30 minutes, the idle time waiting for the next available QC’er will be the midpoint of that time, or 15 minutes. Likewise, the operator will have an average of 30 minutes. This is a very general estimate. If our hypothetical document center performs other functions, a much more sophisticated model may be needed for a fully accurate estimate. However, for a quick estimate, this is sufficiently accurate. That means that the idle time is 15×2 for QC and 30×2 for production time, yielding 2 ½ hours of total idle time. Now add the work time of 1 ½ hours. That means that in order to complete your 90 minutes of work, your document needs to sit in the document center for a minimum of 4 hours. In reality, there will additional administrative overhead (paperwork to complete, calls to update customers, copying of documents, checking print-outs to verify changes, etc.) which will add to the time it takes to return the work to the client. And of course, when the center is busy and work piles up, it could be hours before your document moves to the top of the queue for someone to work on. Continuous Improvement: In this example, or in any center of a reasonable size, when the QC’er hands back the reviewed work, it will usually be handed back to the next available production worker… not to the production worker who performed the original edits. Unless the center has nothing to do, the original worker has taken on other work. How does the original worker ever learn about the mistakes that are made, or even if the worker agrees that they are “real” mistakes? Going back to our document, after it is returned from the 2nd operator, it now goes to a second QC’er, further diluting the opportunity to learn from previous mistakes. The production worker may get a report at the end of the month that lists all mistakes and comments from QC and/or their own managers. Now, more time will be spent to discuss these mistakes, but at the end of the month key information (such as verbal discussions with the customer) may be forgotten or confused. Without the context of the original work, while all of the information is still remembered, the operator is unlikely to learn from these mistakes and improve work. Without real-time interaction with the QC’er, additional rounds of corrections may be required after the client sees the work, and differences/mistakes between QC and production training will persist… generating additional waste and idle time as the work goes back and forth between QC and production. Special training sessions can be set to review weekly errors with production and QC, but if this just becomes an ongoing part of the production process (and not a Six Sigma-like “find and fix” process), then this becomes yet another contributor to waste. Is Quality Control a waste? Only if you pass up the opportunity to leverage each QC review to improve training, eliminate errors and raise quality standards. Correcting the same mistakes, over and over, doesn’t make any sense. The tools exist to fix almost any production problem. In fact, your biggest decision may be to choose the tool that will work best (but many, many tools will do just fine). In just this one example we can see how cost can be 33% to 43% higher and the time delay from all the QC hand-offs can be several times greater than time it takes to do the work itself. You have a HUGE opportunity to improve your service if you change your focus from fixing individual errors to finding and eliminating the source of errors in your work process. And that’s my Niccolls for today! This entry was posted in Best Practices, Decision Making, Improvement, Continuous or Not, Learning and Development, Unique Ideas and tagged change, Errors, Improve, Lean Sigma, Measure, Metrics, QC, Quality, Quantify, Reporting, Six Sigma, transform. Bookmark the permalink. 1 Response to Is Quality Control A Waste of Time? I needed to read through this post twice since it was interesting! beautiful expression, a honestly beneficial article. Thank you. I succeed your site to wish you prolonged success.